This March I’ve spent considerable time pulling up English Ivy and Honeysuckle. “Non-native” or “invasive” doesn't fully convey the amount of aggravation involved in dealing with these uninvited, fast-growing plants. That’s why I love the term “plant spam”. I just discovered this term in an article by Marty Hair, forwarded on by a master gardener in my area. The article goes on to mention a good tip that’s worked for me in dealing with one type of plant spam- mint. I plant mint in a container, then nestle the container among the other plants in my herb garden. I also have chives in a pot, and the containers look colorful in the garden. But the best defense against plant spam is to be careful what you sow. Because what you sow could be what you reap and reap and reap and reap. When I first looked outside this morning, I thought we'd had a snowstorm. The sidewalk was covered in tiny white flecks. But we've had highs in the 50's lately, so it definitely was not snow. Alas, it was only a case of tree dandruff. The rain over the past few days brought down most of the white petals from the bradford pear trees. Don't fret, we are still enjoying plenty of spring blooms here. The pansies are going through a major growth spurt, and the cherry trees looked spectacular last weekend. Jill in North Carolina just posted a nice picture of the blossoms of a cherry tree. The daffodils are still going, too. I was pleased to find that the previous owners of our house had done an interesting job in planting them; there are at least 4 different varieties of daffodils in our front yard. The natural tendency, for me at least, is to pick up one variety and go to town. Here, though, we have a smorgasboard of daffodils poking up under the trees, from pale yellow and frilly to bold lines in orange on white. I'm also thankful the previous owners of our house for bequeathing me their humming bird feeders. I still have the original note she left, with special instructions for feeding them. She was really crazy about those birds, and I promised to take care of them. It was an important part of the negotiations, along with leaving the washer and dryer. What a nice bonus to get along with a house. So I will remember this every time I start resenting them for building "the wall", which will be the subject of a later post. Butterflies do not randomly pollinate any good-looking flower. As I mentioned previously, butterflies have discriminating eyes. And unless female butterflies have indulged too much in dandelion wine , they have some stringent selection criteria on their minds when they are deciding what gardens to pollinate in. Butterflies expect to be wined and dined. If you are running low on cash and just throw in a few milkweed plants, don't expect a migration of monarchs in your backyard. Butterflies like large splashes of color. Lots of color = lots of food. 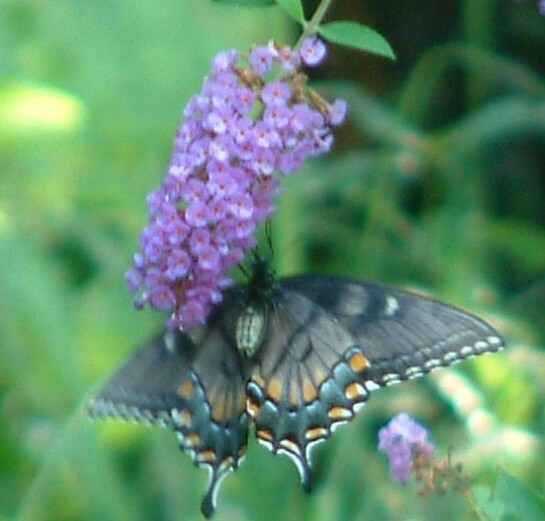 The butterfly bush, Buddleia, will give you a lot of bang for your buck. Another important thing to know about the female butterfly is that like most females, she is hearing the tick of her biological clock and thinking about laying her eggs. Yes, some fine dining might keep her visiting temporarily, but sooner or later she'll be wondering if this where she wants to lay her precious eggs. Keep in mind that her babies have discriminating tastes in food plants. Caterpillars are not the munching machines that they appear. They have discriminating palates. Some will demand a diet of only one specific plant, and then they will have prolonged discussions over their meal- "Hmmm..some nice fruity essences here...munch munch munch...a little bit tannic for my taste though...munch munch munch" So to create a butterfly garden that will keep her coming back for more, you need both nectar plants and host plants. For now my list is short, but if I convince my hubby to help tear up the front yard to make more room for more plants, then there'll be more to report! Looking for more detailed information? The Clemson University Extention has a great article on Butterfly Gardening in South Carolina, including popular nectar and host plants. I've also enjoyed watching the progress of a Texas butterfly garden over at Gardening Obsession. My list of early spring chores continues to expand. It's also time to add some mulch around the established landscape. But what mulch to choose? The variety to choose from out there is just mind-boggling. I decided last year to mulch my herb garden in some kind of wood mulch, and I was surprised at the countless varieties out there. I choose shredded cedar just based on appearances. It seemed to work well for me. Editors note: Please visit my Earth Day post to find out more about mulching.